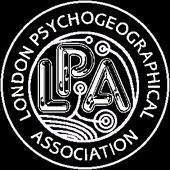 The London Psychogeographical Association (LPA) is an organisation devoted to psychogeography. The LPA is perhaps best understood in the context of psychogeographical praxis. The LPA was first mentioned in 1957 by the British artist  According to many accounts the group (which was also referred to as the London Psychogeographical Institute or Society) eventually merged into the Situationist International. In the 1990s, the LPA was reinvoked as the LPA East London Section by Three sided football matches. This version of the LPA has been described by the writer Iain Sinclair, whose work is often described as psychogeographical, as useful in "branding" that kind of practice. The work of Luther Blissett, Stewart Home and other psychogeographical groups is said to involve the issuing of numerous leaflets and letters under a series of aliases, both personal and organisational, and the description of interactions, including collaborations and feuds, between both these and other, real people and groups (for example between Luther Blissett and the parapolitical researcher Larry O'Hara). The last LPA Newsletter was issued around the year 2000. ^ Smith, Jeremy (2002). "The situationist city". The Guardian Literary Supplement. Archived from the original on 19 March 2004. Retrieved 7 November 2012.